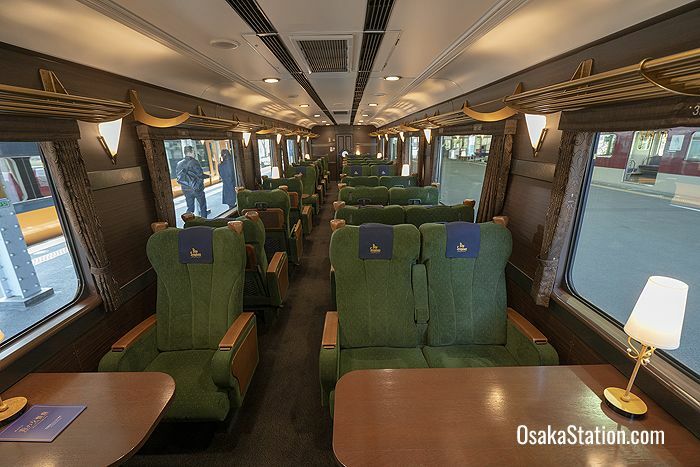 The Blue Symphony is a limited express sightseeing train operated by Kintetsu Railway that runs between Osaka Abenobashi Station in central Osaka City and Yoshino Station in Nara Prefecture. 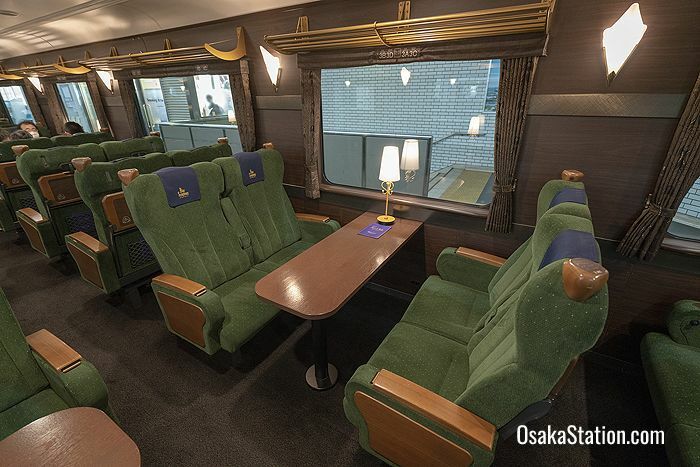 With its elegant deep blue livery, special onboard facilities, and deluxe seating the Blue Symphony is a very enjoyable way to travel from the big city of Osaka to a range of beautiful locations in rural Nara. The ultimate stop at Yoshino is an especially popular scenic spot which is celebrated for the beauty of its cherry blossoms in the spring. Other locations of interest along the route are historic Asuka, scenic Mitarai Valley, and the hot spring spa at Dorogawa Onsen. 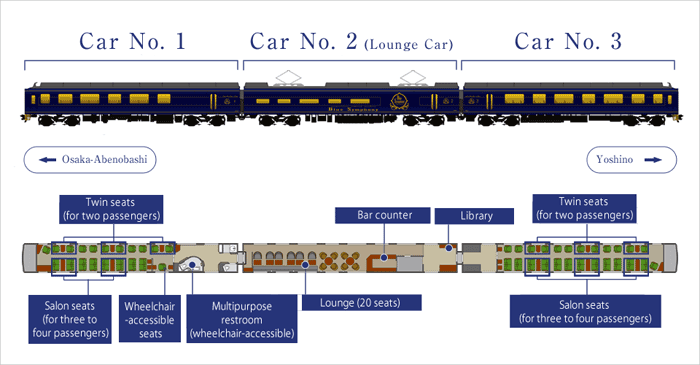 The Blue Symphony is a luxurious three-car excursion train which was remodeled from a #6200 series electric commuter train. 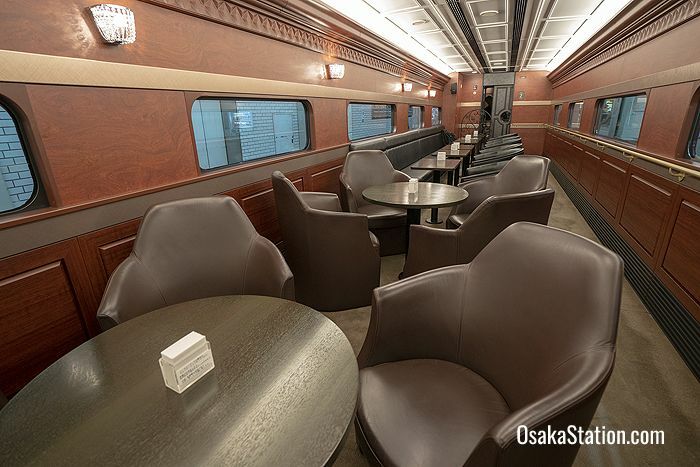 The train’s grand exterior is complemented by a superior level of interior comfort with spacious seating, and plush furnishings. In the first and third carriages the seating is divided into rows of single and paired seats. Some seats are also arranged facing each other in a “Salon” group of four seats or a “Twin seat” arrangement of two seats. Both Salon and Twin seat arrangements come with tables. 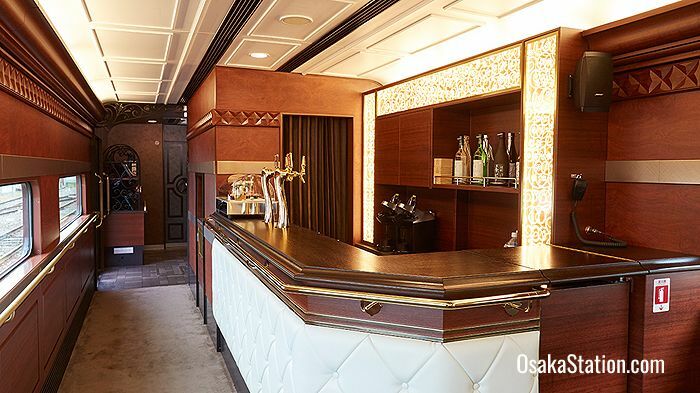 The second carriage has a lounge space with seating for up to 20 guests and a bar counter serving light meals, sweets, and drinks. The second carriage also has a library area with a selection of photo books and guides to Nara prefecture. 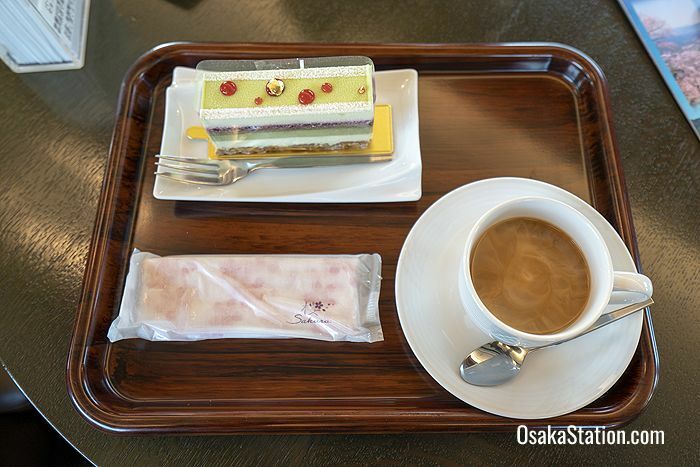 A sandwich set with coffee and tea is available for 680 yen. Alternatively you can get a lunch box of three kakinoha sushi for just 450 yen. Kakinoha sushi is vinegared rice topped with mackerel, salmon, or bream and then wrapped in fragrant kakinoha persimmon leaves to keep it fresh. It is a specialty of Nara and we highly recommend you to try it! For dessert why not try the seasonal cake set which comes served with tea or coffee? On the drinks menu there is an array of soft drinks; grape juice from local wineries, and both hot and iced tea and coffee. If you fancy something stronger, beer, wine and sake are all available. 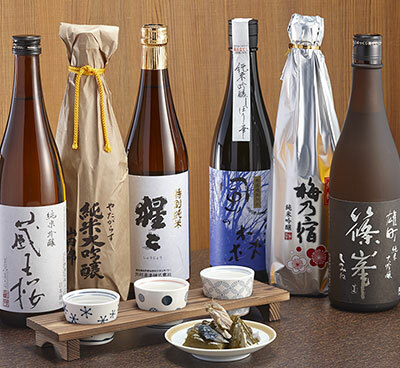 There are also sake tasting sets that you can try which feature sake varieties from the Nara and Yoshino areas. A tasty education in local sake culture! 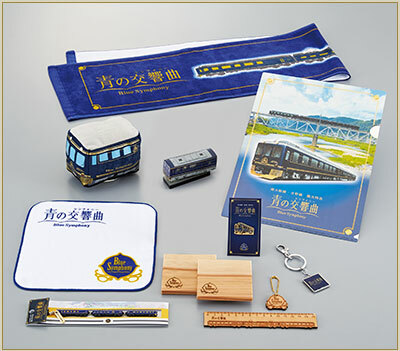 Rail enthusiasts will also be delighted by the range of unique Blue Symphony souvenirs which are available to buy on the train. Asukadera Temple which dates from 588 and is one of the oldest temples in Japan. The Ishibutai Kofun: a large stone tomb which is believed to date from the 7th century. The Manyo Culture Center: a museum dedicated to the 8th century Manyoshu poetry collection. It features many colorful dioramas and interactive displays depicting life in the Asuka era. 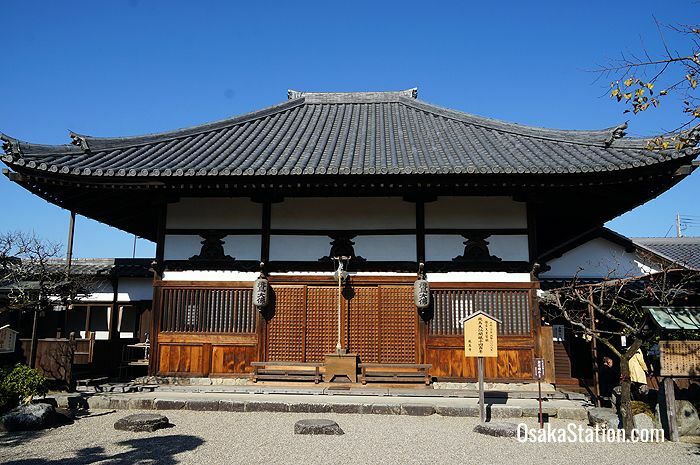 Asuka Historical Museum which displays many archaeological finds from the 6th to 8th centuries. Asuka village is easily accessed from Asuka Station on the Blue Symphony route. To learn more about Asuka’s tourist facilities visit the official Asuka Village website. Tenkawa is a quaint village at the foot of Mount Omine in the Yoshino region. Although this village is not immediately accessible by rail, its hot spring spa facilities and beautiful scenery make it worth the extra effort. The two main attractions here are the Mitarai Valley (called Mitarai Keikoku in Japanese) and Dorogawa Onsen hot springs. Mitarai Valley is a scenic gorge with many waterfalls and deep green pools. 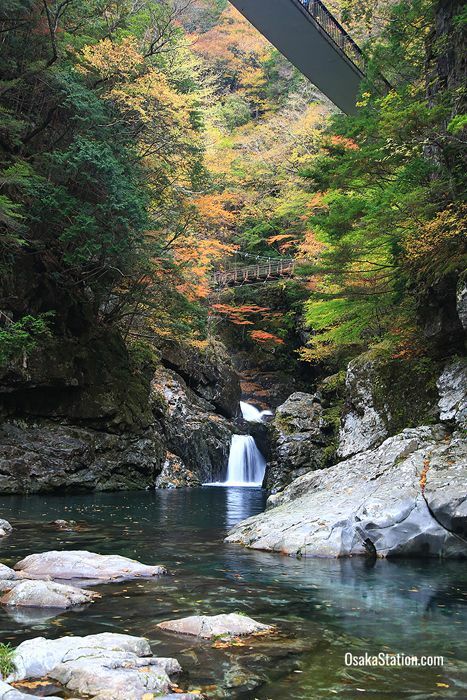 A hike through this valley is best followed with a hot dip at the Dorogawa Onsen hot spring spa. Though the Blue Symphony does not go directly to Tenkawa, you can get off at Shimoichiguchi Station and then take a taxi or bus. You can get a taxi to these destinations from the taxi rank at Shimoichiguchi Station. A taxi to the entrance of Mitarai Valley will take about 45 minutes and to Dorogawa Onsen it will take about one hour. You can expect to pay between 7,000 – 8,000 yen to get to Mitarai Valley and 8,000 – 9,000 yen to get to Dorogawa Onsen. 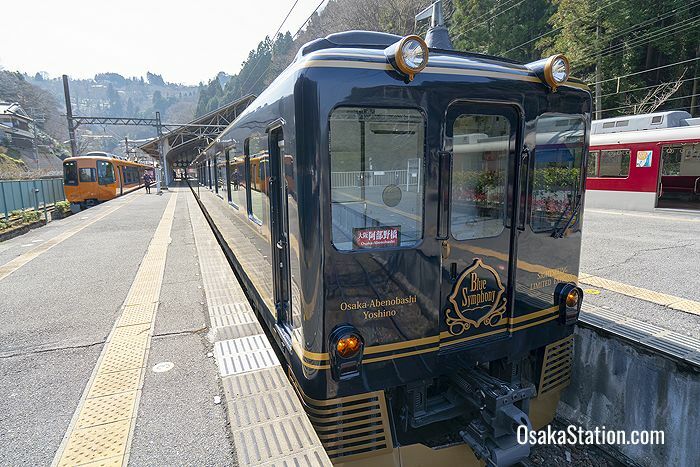 Kintetsu also run a special taxi service from Shimoichiguchi Station to Dorogawa Onsen that is timed to meet the train and is a little bit cheaper than regular taxi services. However, you will have to book this taxi in advance and the website is in Japanese. If you can’t read Japanese then it’s a good idea to have a travel agent or Japanese friend make arrangements for you. However, if this is too difficult, you can still find a regular taxi at the station taxi rank. Buses leave Shimoichiguchi Station regularly between 8.47 and 17.50. But because the two Blue Symphony services reach Shimoichiguchi Station at 11.11 and 15.11, you will have to wait a while for your bus. If you wish to hike through the Mitarai Valley to Dorogawa Onsen, get off at the Tenkawa Kawaai stop and then walk 45 minutes to the start of the Mitarai Valley hiking trail. From there to Dorogawa Onsen it is a 7km walk. Alternatively you can take the bus all the way to Dorogawa Onsen. It takes about 54 minutes to get to Tenkawa Kawaai and one hour and 18 minutes to get to Dorogawa Onsen. At the time of writing the fare to Tenkawa Kawaai is 1,110 yen and the fare to Dorogawa Onsen is 1, 280 yen. There may also be a 200 yen surcharge if you are carrying a large rucksack. For a detailed look at the bus timetable with information about holiday and weekend services check the Japanese language timetable. Please note that the buses which depart from Shimoichiguchi Station at 8.47, 13.20 and 15.20 are bound for Nakaosumi, and though they stop at Tenkawa Kawaai they do not stop at Dorogawa Onsen. If you have made it all the way to Dorogawa Onsen you will probably want to stay the night at one of the many traditional ryokan style inns. There you can enjoy traditional hospitality and local cuisine and maximize your time relaxing at the inn’s hot spring bathing facilities. Here are our top six recommended traditional hotels at this location. Kinokuniya Jinpachi – This is the most popular ryokan style inn in the Tenkawa area. Unusually, both check in and check out times are at 12.00 noon which means you can get in earlier and leave later than at other hotels. This gives you the opportunity to really take your time relaxing at the hotel’s bathing facilities. Atarashiya – This riverside inn is known for its wonderful local food. For a small fee you can enjoy some unique sake and snacks while relaxing on the verandah which overlooks the hotel garden. Hanaya Tokubei – At 500 years old this is the oldest ryokan in the area. There are only seven rooms in the hotel, some of which have their own hot spring water supply. Saratoku Ryokan – All rooms have garden views at this hotel and the bathing facilities also look out over the traditional Japanese gardens. A car rental service is also available at this hotel which makes it easier to explore the surrounding countryside. Kohryokuen Nishisei – This beautiful traditional building is 300 years old and its garden is illuminated at night. Kanko Ryokan Kuboji – There are just seven rooms in this cozy hotel which has a real homelike atmosphere. All the food for hotel meals is supplied directly from local farmers so you can enjoy the real taste of Tenkawa! For more information about Tenkawa visit the official Tenkawa Village Tourism website. Yoshino Station is the last stop on the Blue Symphony’s route. The biggest attraction here is Mount Yoshino which is Japan’s most famous cherry blossom viewing location. There are 30,000 cherry trees on Mount Yoshino and people flock from all over Japan to view them in the spring. Also worth a visit is Kimpusenji Temple, a UNESCO World Heritage Site, which dates from the mid-7th century. 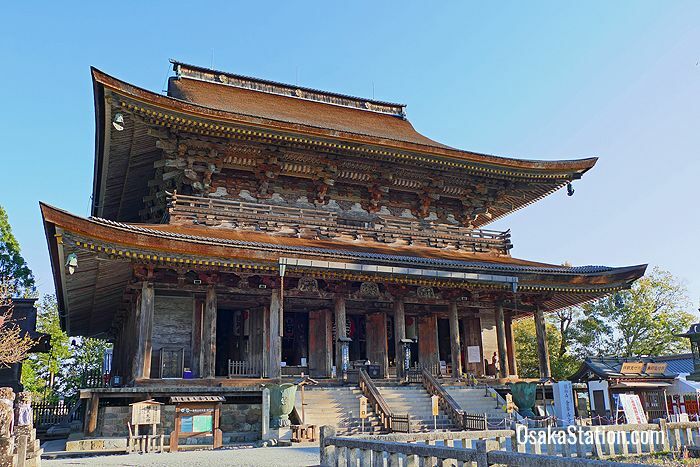 The 34 meter tall Zao Hall at Kimpusenji is the 2nd largest wooden structure in Japan (the biggest is the Great Buddha Hall of Todaiji in Nara). Situated on the slope of Yoshino is the Chikurin-in Temple which is said to have been built by the legendary Prince Shotoku Taishi. The temple complex is now the site of a traditional ryokan inn and bathhouse and also features an attractive landscape garden called Gunpoen which was designed by the tea master Sen-no-Rikyu. For more information about Yoshino visit the official Mount Yoshino Tourist Association website. The Blue Symphony makes two daily return services between Osaka Abenobashi Station and Yoshino Station. The following timetables are for the main destinations on this route. For more detailed timetables, check the official Blue Symphony website. All tickets for the Blue Symphony must be reserved in advance so that all passengers have guaranteed seats. Because the Blue Symphony is popular it is a good idea to book your tickets early. Tickets go on sale at 10.30 a.m. one month prior to the day of departure. You can book tickets online or at ticket offices at major Kintetsu stations. Salon seats and Twin seats however cannot be booked online and must be booked at a station ticket office. Please note that because the Blue Symphony is operated by the private rail company Kintetsu Railway, it is not covered by the Japan Rail Pass. This video from Kintetsu Railway shows some of the natural beauty along the route of the Blue Symphony. Article by Michael Lambe. Photos by Netmobius, (11) toyodama, (12) h-toyo, (13) Yama. All rights reserved.